ALBUQUERQUE, N.M. — Bonfires and peaches are not two words you usually associate with each other, but that is exactly what Danny Romero, an orchardist in El Duende, was thinking about as he lit 300 bonfires in his orchard at the end of April this year. 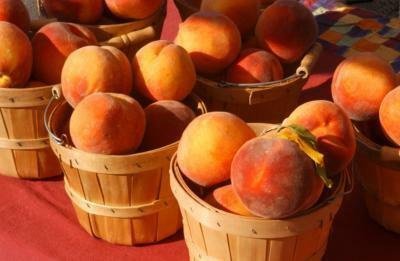 New Mexico is experiencing a good fruit year, with growers’ markets enjoying a bounty home-grown peaches and other fruits. Temperatures that dip below 32 degrees once trees have flowered can be fatal for a crop, and New Mexico orchardists lose many nights of spring sleep worrying about this scenario. If you have just a few backyard fruit trees you can cover them with a tarp or string Christmas lights to keep them warm, but when you have 500 trees like Romero, you need to scale up the solution. “The local fire department wasn’t happy me with me that night,” Romero says, but his peaches were saved and now farmers’ market shoppers in Santa Fe are literally enjoying the fruits of his labor from that night. Like many growers around the state, Romero grows a number of peach varieties that not only taste slightly different from one another, but also have varied harvest schedules. So as the Red Havens finish up, for example, it’s time for Flaming Furies, J.H. Hales or Elbertas. White-fleshed peaches tend to have a slightly later bloom. You will find varieties that are both clingstone and freestone at markets. Just ask the farmer what he or she has available. Nectarines – which are just fuzzless peaches – are even more prone to insects, disease and frost injury, but when they survive spring they have just about the same harvest schedule as peaches. An even background color of golden yellow for yellow peaches, and creamy yellow for white-flesh peaches. A slight give to the flesh – neither rock-hard nor mushy. Note: Peaches bruise easily so don’t use your fingertips to check for firmness. Instead, hold the peach in your whole hand. They should feel heavy for their size. Find fruit that smells how you hope it will taste. Keep peaches on the counter at room temperature until they are the ripeness you prefer. To quicken the ripening process, place peaches in a paper bag. Ripened peaches should be stored in the crisper bin of your refrigerator where they will keep for up to five days. Do you have more peaches on hand than you can eat or bake right away? Peel and slice them, lay them on a baking tray and put them in the freezer for a few hours until they’re frozen through. Transfer the peach wedges to a re-sealable plastic bag and freeze until ready to use. They’ll keep at least six months and are perfect to use in baking or smoothies. The best peach is the one you bite into that drips down your elbow and chin. All you need to do is wash thoroughly and rub with a paper towel to remove the fuzz. Sliced or chopped peaches will discolor, so toss them with lemon juice to retard browning. If you have a recipe that requires just a few peaches without skin, peel them after you pit and slice them. You can simply peel it off with your fingers or a use paring knife to scrape it off. If you’re making something that requires lots of peeled peaches, you’ll want to slip their skin off by blanching them for about 40 seconds in boiling water. If the peaches are slightly under-ripe, allow them to remain in the hot water a little longer – up to a full minute – and it will help the peel loosen and improve their flavor. Use a sharp paring knife to make a small “x” through the skin at the base of each peach, and prepare a large bowl of ice water, so after the peaches have their hot bath you can cool them down right away. Drain the peaches and pat them dry. Good fruit years in New Mexico are a wonderful thing, and 2017 is shaping up to be a great year. Visit your nearest growers’ market, and in addition to peaches, be sure to also look for plums, pears, apples, watermelons, cantaloupes, casaba melons, grapes and other great locally grown fruit through September. Lucky for us, growers like Romero know what it takes to keep their orchards in bloom even when spring throws them a curve ball. 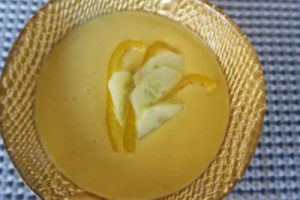 Sweet and tangy Chilled Peach Soup with Goat Cheese is a great option if your peaches are bruised. In a bowl, toss the peaches, diced cucumber, yellow pepper and apricots. Add the honey, goat cheese, white balsamic vinegar and 2 tablespoons of the olive oil. Stir in 1½ teaspoons of salt. Add the garlic. Cover and refrigerate overnight. Discard the garlic. Transfer the contents of the bowl to a blender and puree. Add ¼ cup of water and puree until very smooth and creamy; add more water if the soup seems too thick. Season with salt and vinegar (as needed). Refrigerate the soup until very cold, about 1 hour. Pour the peach soup into shallow bowls and garnish with the sliced cucumber, sliced bell pepper, goat cheese and basil. Drizzle lightly with olive oil, season with black pepper and serve. 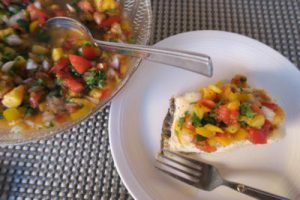 Peach Salsa is a great topping for fish, pork or a veggie burger, as well as a dip for tortilla chips. Dice tomatoes and transfer them to a large bowl. Finely chop the seeded bell pepper, jalapeño(s) and onion. Transfer all veggies to the bowl. Dice the peaches. A slightly larger dice for peaches makes them center stage in this salsa. No need to peel them. Transfer peaches to the bowl. Add the cilantro, lime juice, salt and pepper. Add more salt and pepper to taste if desired. Fold everything together until well mixed and enjoy with your favorite fish, pork, veggie burger or tortilla chips. 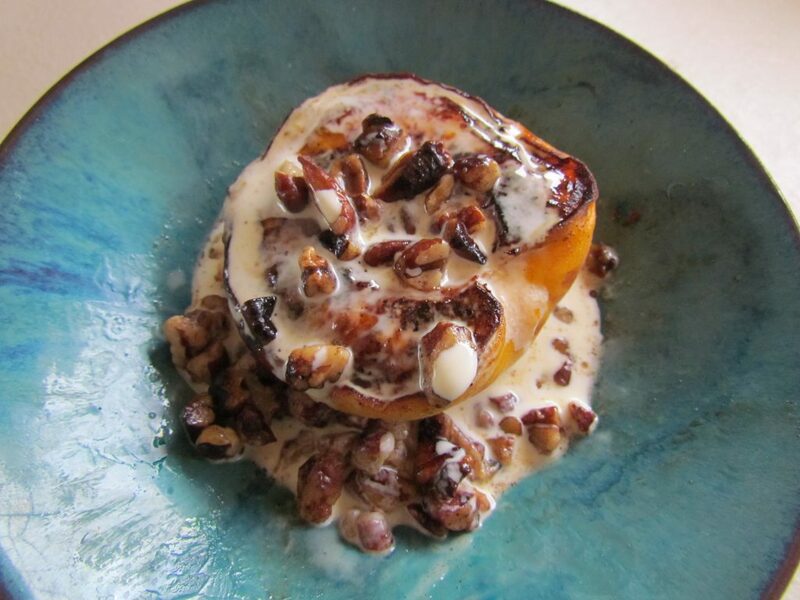 This simple recipe makes use of both New Mexico peaches and pecans! It’s delicious, and comes together in minutes. Get the recipe here.